Passover is later this month, and it brings me back several years ago to our first Lidia Celebrates America special where we celebrated four different ethnic holidays. I was invited to a home in Brooklyn, along with my friend Ruth Reichl and the four-generation owners of the specialty New York food shop, Russ & Daughters. There I learned about many of the culinary traditions behind Passover. On our Passover seder menu we enjoyed smoked salmon, charoset, chicken soup with matzo balls, and, of course, beef brisket and horseradish. This was a very special celebration for me, and that brisket was absolutely delicious. I’m sharing two of my favorite recipes from that memorable holiday here. Pour lemon juice over freshly cut apples to prevent the apples from turning brown Mix together all remaining ingredients. Cover meat with water in a large pot. Add the bay leaves and onion. Cook over medium heat about 3 hours, until the meat is very tender. While the meat is cooking, mix the brown sugar and mustard. Preheat oven to 325. Take meat from water and remove all visible fat. Insert cloves, as if it were a ham. Cover meat with the mustard/sugar mixture and bake one hour, basting frequently with peach syrup. 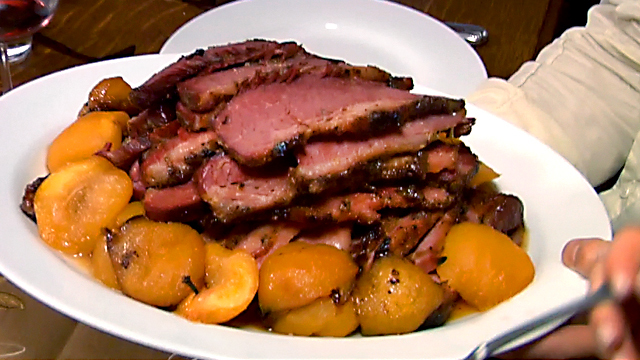 Surround meat with spiced peaches and serve. Recipe provided by Ruth Reichl.